Referred to as ME/CFS, myalgic encephalomyelitis is a chronic fatigue syndrome caused by neuroinflammation of the brain and the spine. The disease causes profound fatigue after even walking, talking or concentrating. After hearing that her neighbor’s son was ill with a disease, she talked to her neighbors and found out he was suffering from ME/CFS. She noted how in pain his parents were, both because of his condition and because of the lack of community understanding of the disease. 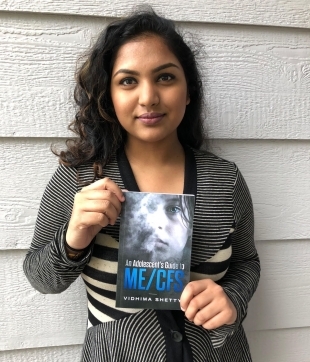 She set out on a mission to raise awareness about the disease and ended up writing and publishing her 122-page book, which covers possible causes, the lack of understanding from the outside world, and coping strategies. With the help of Russian Hill Press, she published the book in August. You can buy it on Amazon for $7.49 in paperback, or $6.99 Kindle. All proceeds are donated to the Open Medicine Foundation, which is doing research to find a cure for ME/CFS. Her goal is to spread awareness about the disease and use her voice to help other people.